My first electric guitar was a Squier Stratocaster, which I bought in around 1989. To this day I regret selling it as it was a beautiful guitar. The build quality was first rate, it was easy to play and the tone that it produced was top notch. Sadly at the time I had my heart set on a Floyd Rose armed super strat and my first Squier Stratocaster was traded-in as part exchange for the new guitar. Needless to say I never really enjoyed playing the super strat, and so to this day the regret lasts. You therefore could say that I am perhaps biased but really for the price I am not sure you can get a better quality starter guitar than the Affinity series Squier Stratocaster. 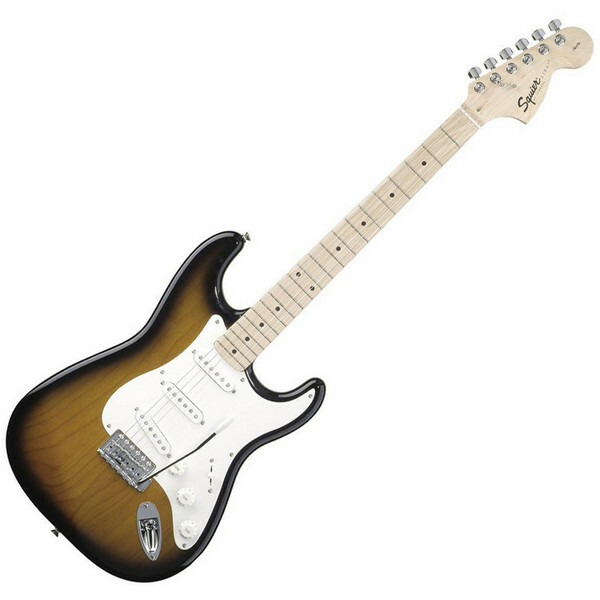 The Affinity series is the entry level model of guitars designed by Fender and released through their Squier brand. Although not a Fender there is the re-assurance that it is from the Fender company so what does the Affinity series Squier Stratocaster have to offer? In terms of the guitar itself there is not much that I can write that has not already been written. After all it is a Strat! Unsurprisingly this guitar has the traditional Stratocaster contoured body shape with double cutaway allowing easy access to the upper frets. The body is made from alder and comes in a range of finishes but we have to say our favourite is the two turn sunburst version. The bolt on maple neck has 21 medium jumbo frets with the normal C shaped neck profile. The width at the nut is a comfortable 40.6 mm and the action was low enough, out of the box, but not too low that it would cause fret buzzing. The pick-up configuration is the standard three single coils accessed through a five way selector switch. There is a master volume and two tone controls allowing great control of the sound of the guitar. The bridge is a synchronous tremolo unit which is reasonably stable allowing some whammy bar action but nothing too strenuous. Mind you if you are looking for that, then this guitar is perhaps not for you! Plugged in this guitar sounds great both clean and distorted. I would have to say, for me nothing beats a Stratocaster for its clean tone and this Squier Stratocaster is no different. There is some hum at high volume but nothing that you wouldn’t expect from single coil pick-ups. The three single coils combined with the tone controls allow you to create any tonal combination from screaming blues to heavy thrash so this guitar will satisfy most musical tastes. All in all this we like this guitar, the build quality reflects the price point of the instrument, it isn’t going to set the world alight but it is a great starter guitar which should have enough to satisfy most budding novice guitarists. For us the Affinity series Squier Stratocaster gets a big thumbs up.